Please read the article at their website, but as usual we have to print the entire piece here because the Bajan news media often re-writes history. The Vaucluse raceway must be saved. 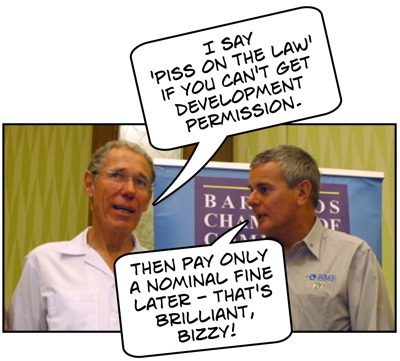 Outspoken businessman and motor sport investor Ralph Bizzy Williams wants the long running controversy surrounding the legality of the popular St. Thomas track settled once and for all. He said while the planned $18 million improvements to the larger, and better known, Bushy Park facility would be a blessing for motor sport and the country, Vaucluse was needed to complete the puzzle. Questions have been raised in recent years about the legality of the racing facility, but Williams said if it was constructed without necessary permission, rather than shutting it down, those behind it should be fined and allowed to proceed. Williams said once the race track was deemed illegal, fining those responsible and allowing them to remain open was the option he preferred. “You don’t expel a Barbados scholar the first time he tried to bomb the headmaster, you call him in and cut his backside; straighten him up. Call in (the owner of Vaucluse), put some licks in him and give him the permission to go and develop this thing for the benefit of Barbados,” he said to applause. I love the the man’s business acumen and care interest in people development… but do not break the law as this will fuel other citizens who may have misguided ideas. Barbados would be a better place if we enforced the laws but lawbreaking is beyond colour or class. This morning I saw three  illegal minivans taking people to town in traffic along Waterford Bottom. They pay no insurance, no permit, two of them had a regular number and one was a ZM. Police for the last two weeks have been stationed at the junction there and these illegals just sail right by. Does Bizzy own these too? I remember digging yams in the field that is now the Vaucluse race track. I also recall seeing truck loads of dirt being removed from the site to make it unsuitable for agriculture. Town planning attempted to rectify the situation but they were called off. I wonder who will call them of with respect to the preschool in today’s Nation. I am not racist, but you remember Gline Clarke’s comments about the white boys. Is it true and Clarke was the only one with the courage to voice it. BAN motor SPORTS @!!! Let them race donkey carts !!! Motor sports is bad for the Environment , NOT NEEDED for Tourism !! BAN iT , LET THEM play by themselves!! DON’t SUPPORT iT , BOYCOTT iT !!! it is interesting to note that in todays Nation a Pre School is being shut down by Town and Country on the grounds that it is located in a building that is on agricultural land. Residents complained of noise and high traffic and congestion in the areea that was caused by the Pre School. How does this measure up to the noise, traffic and congestion of a race track? What Bizzy is promoting is nothing less than an extension of the ZR culture. “Is we who make the rules! Laws don’t apply to us”. Lets forget for one minute that this is zoned agricultural land that was purchased by a non-farmer who promptly turned it to bush and claimed he couldn’t make money farming it. He was planning housing and golf course. Who had the experience in developing golf courses? Non other than his good friend BIzzy Willaims and his family. Are they not partners in a housing company as well? But the the boom ended and nobody wants to invest in upscale housing now, so the next best thing, “screw the local residents and let’s get on with developing a race track and make a little change.” Vaucluse is in a high rainfall area and is prime agricultural land. How the government handle this will define them forever. Hands up those who think Bizzy would still be so in favour of his “damn the torpedos, full speed ahead and to hell with the official channels and bureaucracy” approach. The application for the Vaucluse track was denied and an order was issued to remove it. Denied 2 days before the last elections. That is how it transpired: 2 days before the election. Let’s watch this final decision get changed or overturned, prove it to us again, that you are above the law, and let’s watch to see if DLP is as bad as the previous administartion. Guess who will fund whom in upcoming elections? Clothed in the transparent emperor’s garments, there you stand Mr. Williams, along with the rest of the adoring, blind, illegal entourage; in the garments of abject, unadulterated, naked, uncaring; greed. Outstanding piece of critical comparative analysis. Couldn’t want it better! We will watch those responsible for granting formal permission for this business to continue. The PM is the minister responsible for Town & Country Planning affairs. Campaign funding before justice and fair play? Bizzy is a man that I HAD a lot of respect for. He has now exposed his greed for all to see. @anonymous:Any thing to do with his new wifey? BFP, the Vaucluse Raceway developer was in the paper the other day confirming that they went ahead and broke the law because of government red tape, whatever that means. Look it up and do a post on it because it was as stupid as Bizzy’s statement. So under that reasoning, I should be able to go and get a building code from one of the other islands, British Virgin Islands, Cayman Islands, Bermuda or somewhere, bypass Town and Country Planning completely and rush and build myself a nice 3 story bungalow and then tell the government fine me if you want when I done but left meh house dey? The Bahamas just moved of Freedom of Info. Bahamas is the new Barbados. Prime Minister, Anti-Crime Legislation, Criminal Procedure Code (Amendment) Bill. I wish to advise of the tabling for First Reading, a number of Bills. I am also pleased to table the Freedom of Information Bill which seeks to grant the public a right to access records held by public authorities, subject to exemption required to balance the right against the public interest in excluding certain governmental, commercial or personal information. The Act provides definitions for information to include a written record, map, graph, plan, photograph, disc, tape, sound track or other devise on which data or sounds are embodied. The Act does not apply to judicial function of a court or the holder of a judicial office; the Royal Bahamas Police Force, Royal Bahamas Defence Force, the Department of Immigration, Customs or the Financial Intelligence Unit in relation to their strategic or operational intelligence gathering.